With spring beautifully in full bloom, I decided to enjoy the season with a visit to GreenAcre Park. Never heard of it? Until recently, neither had I. It's one of the many small parks hidden around the neighborhoods in Manhattan. GreenAcre Park is located on 51st street, between 2nd and 3rd Aves., next door to a synagogue. It is just a small nook off the street, but it has a stunning 25-foot waterfall cascading over a rock and concrete wall and small man-made rock-bed stream running down to the pool. 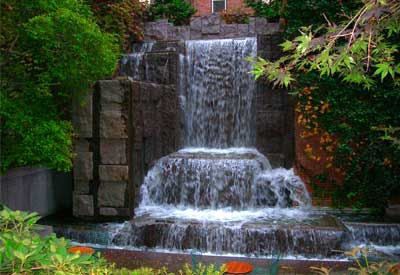 It is a quiet secret oasis in midtown where you can enjoy lunch or read a book while the soft spray of the waterfall mists across the small gardens and flowering trees. There are three different levels to the park, each with tables and chairs overlooking the waterfall from different vantage points. Shady trees project dappled sunlight upon the water, tables and chairs and the landscaping envelopes the park with lovely manicured flower beds and lush greenery. There is also a small refreshment stand, which I hear offers excellent apple pie. The park is open to the public, but privately maintained by the Greenacre foundation.